Simple motion inside biological cells, such as the streaming of cytoplasm—the liquid cell interior—is widely believed to be essential for cells and the development of complex organisms. But due to the lack of suitable tools, this intracellular motion could so far not be tested as hypothesized. Now, a team of researchers from the Max Planck Institute of Molecular Cell Biology and Genetics (MPI-CBG) in Dresden found a way to induce and control motion within living cells and early embryos. Rather than using microscopes simply for observations, the team around Moritz Kreysing managed to actively guide central developmental processes in worm embryos by a new cell-biological technique called FLUCS. This new microscopy paradigm paves the way towards a systematic understanding of how complex organisms develop and what keeps them protected from malfunction and disease. These findings were published in the current issue of the journal Nature Cell Biology. A central question in biology is how entire organisms develop from single fertilized eggs. And although genetic research has revealed deep insights into this enigmatic subject in recent years, one particular aspect of development remained elusive. For an organism to develop a structured body, biomolecules need to move to specific sites inside the embryo, similar to building material on a construction site. A particularly important example for this distribution of material inside cells is the polarization of an embryo, which defines where the head and tail of a worm will grow. But until now, it has remained controversial which transport mechanisms define this head-tail polarization so precisely, because it was not possible to move the inside of an embryo without harming it. 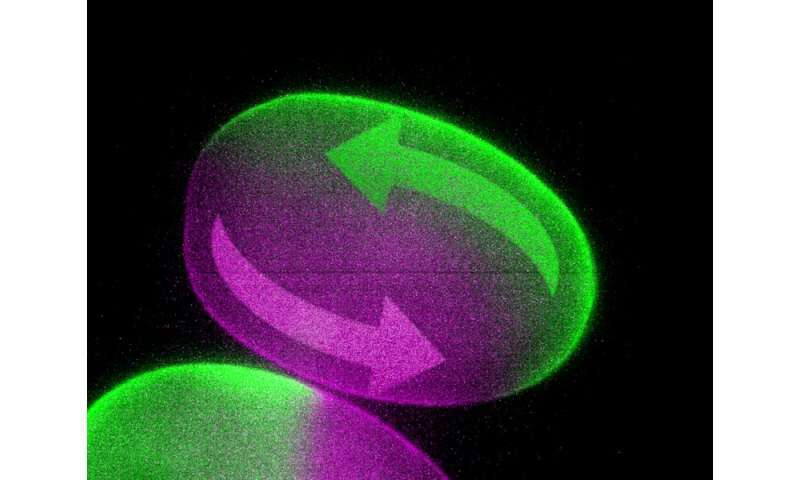 A team of researchers around Moritz Kreysing in collaboration with other groups at MPI-CBG, as well as the Faculty of Mathematics and the Biotechnology Center, both of the TU Dresden, has now succeeded in inducing controlled flows in living embryos with a non-invasive laser technology called FLUCS (focused-light-induced-cytoplasmic-streaming). With this truly revolutionary tool at hand (see figure), the researchers were able to probe the function of cytoplasmic motion in the process of embryo polarization. Matthäus Mittasch, the leading author of the study says: "With FLUCS, microscopy of growing embryos becomes truly interactive". And indeed: with the help of realistic computer simulations the researchers even managed to reverse the head-to-tail body axis of worm embryos with FLUCS, leading to inverted development. Lead investigator Moritz Kreysing, with a dual affiliation to the Center for Systems Biology Dresden, concludes: "The ability to actively move the interior of biological cells will help to understand how these cells change shape, how they move, divide, respond to external signals, and ultimately how entire organisms emerge guided by microscale motion." On the medical side, FLUCS has the potential to improve our understanding of developmental defects, aid in-vitro fertilization, organism cloning, and the discovery of new drugs.